Mix dry ingredients, blend in butter, stir in milk until dough is soft. Knead a bit and roll into bite size balls. Heat enough oil (we used peanut oil) to cover 4 dough balls, keep Jetboil on simmer. Put dough balls in (4 at a time) and roll them around in the oil occasionally. Remove when golden brown and roll in cinnamon & sugar immediately. Put 5 cups of corn flakes in a gallon size zipped storage bag and then crush. Measure 1/4 cup dry milk and put into a portable container. Measure 1/3 cup packed brown sugar and put into a portable container. Measure 1/2 cup corn syrup and put into a portable container. Measure 1/2 cup peanut butter and put into portable container. (Tip: The single servings of Jif to Go are 2.25 oz each. You can use two of these. It's slightly more than 1/2 cup but it works well and simplifies preparation). Combine corn syrup, peanut butter and brown sugar. Turn Jetboil on to a low temperature setting and place the pot on the burner. Stir the mixture constantly until it becomes smooth and hot (about 3 minutes). Remove the pot from the burner. Stir in the dry milk until blended and then add the corn flakes. The mixture will stiffen. Roll mixture into balls and enjoy! Add 30 ml (1 fl oz) olive oil - Adjust simmer control spindle to high heat. Adjust control spindle down to simmer for 5 minutes. Turn off heat. Use Minimo lid to cover and let sit for 3 minutes. Garnish with 10 g (.4 oz) chopped fresh basil and 50 g (1.8 oz) grated parmesan cheese. Bon appétit! Thanks JetBoil for keeping camp cooking tasty! Stir and allow to rehydrate. Thanks to our friends from Good To-Go for the recipes and ideas! "The trick to “open-fire” cooking is heat, used judiciously. A fire pit, covered with a strong grate (an oven rack works well) is your best option for cooking." Everyone loves Thanksgiving! It’s all about food, friends and giving thanks for the wonderful things in our lives. We plan, prepare and cook to our heart’s content. So this year, while you plan your #OptOutside adventures, you might consider getting a jump on nature by having Thanksgiving dinner outside as well! Preparing Thanksgiving dinner might sound daunting but it doesn’t have to be. Stick with the basics, focus on friends and success is inevitable. Here’s a menu that is a sure winner and best of all, most of the ingredients can be picked up at the grocery on your way out to the great outdoors. Cooking a whole turkey, over a fire, can be a lot work and also time consuming. (We’re sure you’d rather spend your time on the trails.) But smoking a turkey breast is just delicious, quick, and surprisingly easy. There’s no need for a fancy smoker—with a little imagination, a smoker can be made out of a myriad of kitchen pots and pans. A traditional New England steamer, used for steaming open soft shell clams can easily be transformed into a smoker. Once the spigot is removed, you have a smoker that can sit over an open fire and slowly cook a turkey breast. The trick to “open-fire” cooking is heat, used judiciously. A fire pit, covered with a strong grate (an oven rack works well) is your best option for cooking. First, make a generous fire using good-sized logs. The goal is to gain enough heat in the ring while burning down the logs to smoldering coals. Place the “smoker” on the grate with the hot coals six inches below. The chips will begin to smoke after 15 minutes or so. If they don’t, stoke the fire and add more wood to get it hotter. It’s ok if there are some flames, but don’t let the fire engulf the smoker. The internal temperature of the smoker should be between 375F and 425F. This can be monitored with the help of an oven thermometer inside the main chamber. Place four cups of applewood chips, soaked in water overnight, in the bottom of the steamer while the breast cooks in the main chamber. (Remember to cover the pot to keep the smoke inside!) The boneless breast is best prepared by rubbing with butter, lemon zest, chopped thyme, salt, and pepper. Make a make-shift pan out of foil, turning up the edges so to hold the juices from the breast. It should be slightly larger than the breast itself. Set this into the main chamber. Depending on the size of the breast, it will take around two hours to cook. While the turkey is smoking, you can prepare and cook the rest of your dinner. The stuffing is best prepared in a four-quart cast iron Dutch oven. Place the Dutch oven on the grate to pre-heat. Once hot, add one-half pound of sweet sausage meat, mixing it to cook evenly. Add one diced onion, cooking until soft. Toss in two minced garlic cloves, one cup of diced celery, one-third cup of fresh chopped sage, two tablespoons of fresh chopped thyme, and eight tablespoons of butter. Cook for a few minutes, then add one 14-ounce bag of dried bread stuffing, one-and-a-half cups of chicken stock, salt, and pepper. Mix well. Top with four tablespoons of butter. Cover the Dutch oven and keep it close to the hot coals, approximately six inches. Turn the Dutch oven every 15 minutes to heat it evenly. It will heat throughout and get crispy and crunchy on the top and sides in about 45 minutes to an hour. In a two-quart pot, place five or six small sweet potatoes, peeled and cut into one-inch cubes. Cover the potatoes with water and season with salt. Place it on the grate and bring the water to a boil. Simmer until the potatoes are soft. Hold a spoon or whisk on the edge of the pot and pour off all of the water. Using a potato masher or a firm whisk, smash the potatoes. Add one-half a cup of heavy cream or half & half and one stick (eight tablespoons) of butter. Season with salt and pepper and whip together. Cover the potatoes and set them to the side to keep them warm. With some slight doctoring, it’s easy to create an improved version of canned cranberry sauce. Take the sauce, mix in one tablespoon of grated fresh ginger, two teaspoons of orange zest, and one-fourth a cup of fresh orange juice. That’s it! Fast and delicious. The last savory dish is a stove top rendition of a classic green bean casserole. In a four-quart pot, melt one stick of butter (eight tablespoons). Add one medium onion, cut into one-fourth-inch matchsticks. Sweat the onions until soft. Add eight ounces of sliced mushrooms, season with salt and pepper, and cook through. Add one pound of frozen cut green beans and one pound of frozen sweet peas. Add three-quarters of a cup of half & half and cook down by half. Season with salt and pepper. Once thickened and hot, it’s ready to go. 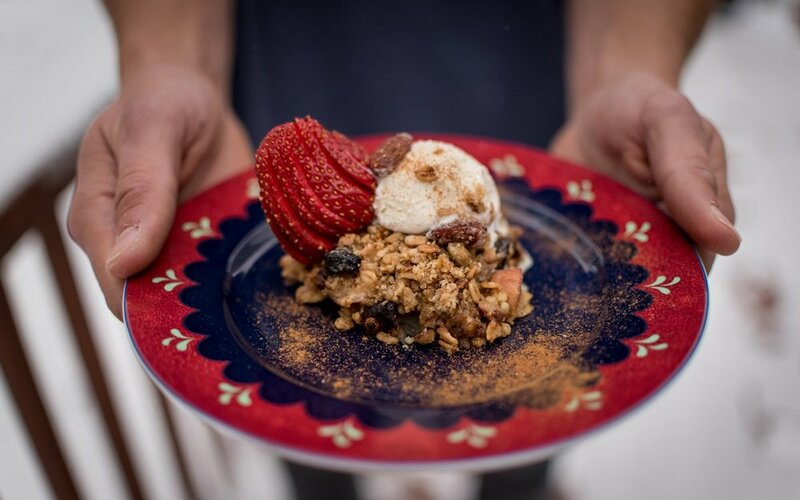 The dessert can also be made right on the open fire using a 12-inch cast iron pan. Add three-quarters of a cup of brown sugar, one-fourth a cup of apple cider, juice from one squeezed lemon, a pinch of salt, and a teaspoon of cinnamon to the pan. Place on the grate over the fire and cook for five to ten minutes. This will bubble but do not let it burn or over brown. Add six tablespoons of butter, one tablespoon at a time, incorporating it into the glaze with each addition. Decoratively arrange six apples (I recommend honeycrisp) into the glaze, rounded side down. The apples should be peeled, quartered, and cored. Cook for 20 more minutes. Lastly, place a sheet of puff pastry—cut into a round shape the same size diameter of the pan—over the apples, tucking the sides down into the pan. Cover the cast iron pan with another 12-inch cast iron pan. Place the pan six inches above the hot coals and spoon hot coals onto the top of the cast iron pan. Bake it like this for 20 minutes, or until the crust is golden, puffed, and done. Pull the pan from the heat and let it cool for 20 minutes. Cover the pan again with the other 12-inch cast iron pan and flip the it over, inverting the tarte. Enjoy your dinner and your beautiful surroundings. If oven is available, preheat oven to 350 degrees F (175 degree C). Otherwise break out that cast iron! Place sliced apples in an 8x8” pan. In a medium bowl mix together white sugar, just 1 tablespoon of flour and ground cinnamon. Add water and mix. Pour liquid mixture evenly over sliced apples. Combine dry Good To-Go Granola (do not add water as directed on back of pouch), remaining flour, brown sugar, baking powder, baking soda and melted butter. Mix thoroughly (this can be done right in the Good To-Go pouch). Crumble evenly over apple mixture. Bake at 350 degrees F for roughly 45 minutes. Otherwise simmer on lowest heat with lid (or an additional cast iron in place of a lid). Let cool and enjoy! Prepare Good To-Go’s Classic Marinara with Pasta and dice fresh mozzarella into ¼” cubes. Heat cast iron skillet with a bit of olive oil over medium heat and sear chicken breast on for 8-12 minutes on each side (or until chicken is cooked through). Turn the burner down to a simmer and add Good To-Go’s Classic Marinara with Penne around the chicken breast. Add the extra marinara sauce and roughly half of the basil. Let simmer for 5-8 minutes over low heat (uncovered). Add mozzarella on top. Cover and let simmer for an additional 5-8 minutes (or until the cheese is melted). 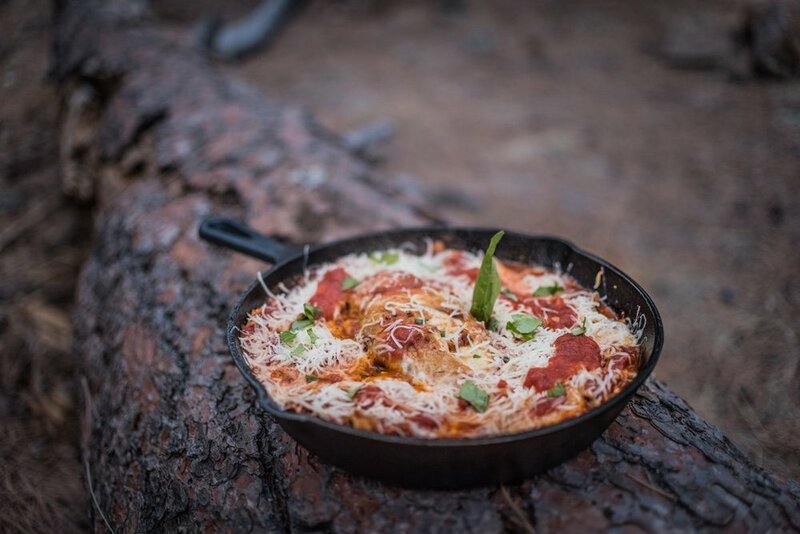 Uncover, garnish with remaining fresh basil and wow your backcountry guests! Heat cast iron skillet with a bit of olive oil on medium heat and sear chicken breast on for 8-12 minutes on each side (or until chicken is cooked through). 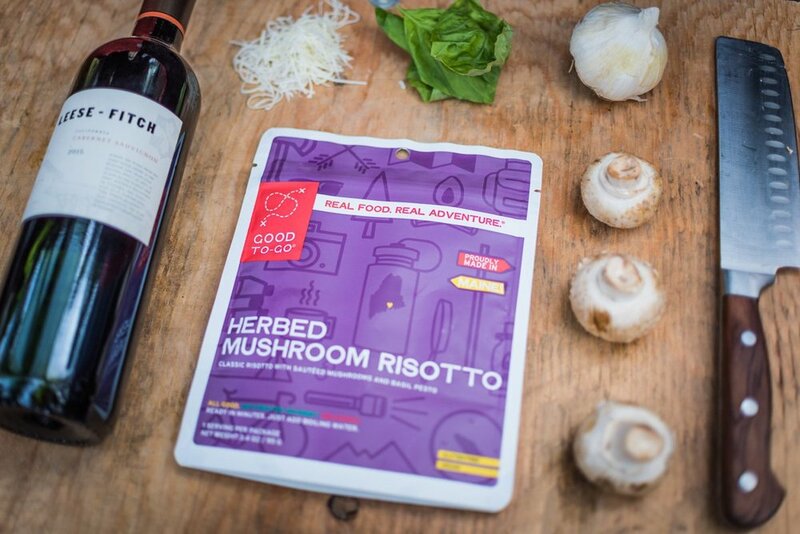 Turn the burner down to a simmer and spread Good To-Go’s Herbed Mushroom Risotto in skillet around the chicken breast. Add prosciutto and sliced mushrooms. Grace the dish with a liberal splash of last night’s leftover wine and cover. Let simmer for 10-15 minutes. Top with freshly diced parsley and devour! Prepare the Good To-Go Mexican Quinoa Bowl. While waiting for rehydration, dice the bell pepper and onion and sauté in cast iron pan with your choice of butter or olive oil. Fill and roll tortillas with onions, peppers and shredded cheese then place side by side in cast iron. Pour Good To-Go Mexican Bowl over the tortillas and top first with desired amount of salsa, then a liberal amount of shredded cheese. Simmer over low heat for 15-20 minutes with lid and serve with sour cream. Prepare Good To-Go’s Indian Vegetable Korma. Crumble ½ cup dry instant ramen noodles. Portion out Indian Vegetable Korma (fully rehydrated) onto lettuce leaves and sprinkle the crumbled noodles atop for a crispy crunch. Welcome to the place where you should come to find cooking inspiration for both camping and maybe even at home. 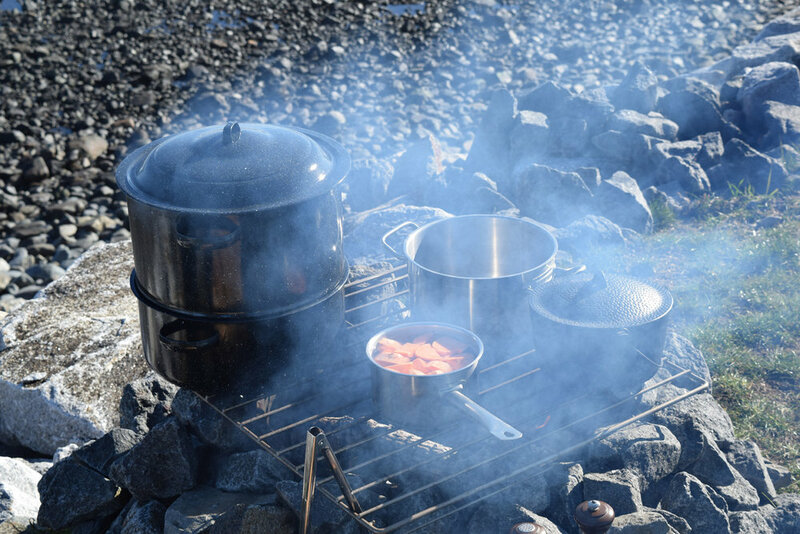 Most home recipes are too complicated to be made at a campsite, while most camping recipes are too unhealthy to eat for anything more than a few days. So here are our attempts to bringing everything together and finding new unique tips, tricks and recipes for cooking in the backcountry. Whether you’re a car camper, backpacker, vanlifer, truck camper, boater, or cabin dweller, we are your place for discovering a better way to eat in the great outdoors. 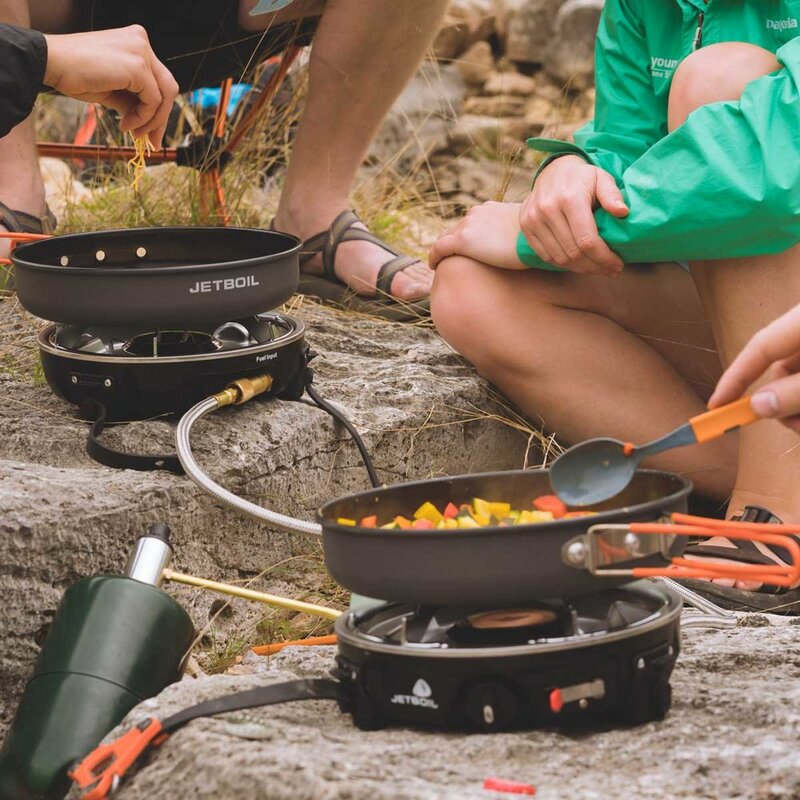 We work with our brands JetBoil, Eureka!, Grayl, and Good To-Go Foods for inspiration everyday. We hope you enjoy!